I organize a winter hike to Tête des Muets from Le Reposoir (60 km from Geneva) on Sunday February 28th. First we climb to the first summit of the northern ridge of the Aravis mountains, the head of the Sallaz, then we will continue on the ridge to the Head of Dumb (2075m). 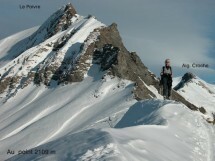 Beautiful snowshoeing and impressive ridge north of the Alps.